Indiana Glass, Lancaster Colony Co.
Brass and Copper, small and large decorative display. Kitchen tools, meal making vintage accessories. Star Wars toys, games, etc. Wooden Rocking chair - handmade primitive farmhouse furniture. Farmhouse furniture Folk Art solid wood stool with peg game holes on the top. Vintage armchair in Mid Century Retro style with tapestry body and wooden legs, comfortable seating. Vintage Mid Century wooden phone, gossip, chair with table in Cottage Chic style. Gordon's Furniture desk with stool. Wooden vintage furniture set. Antique Wheelchair by The Colson Corp, USA. Large vintage wooden rocking chair. Vintage Asian Garden Stool with Lotus flowers, Cranes hand painted decorations in pale green and pink colors. Antique Chinese Scholar/Governor wooden chair. Antique American Victorian period platform rocking chair with upholstered seat and back. 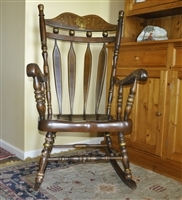 Rosewood vintage Hall chair with cane accents by Hayat & Bros. Copyright © 2013 LIKETHATBEA. All Rights Reserved.